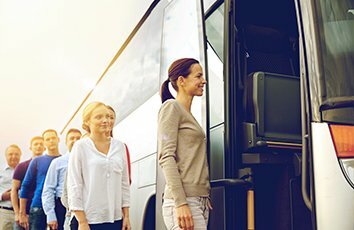 Corporate groups prefer to travel together and travel in luxury. Busy executives on their way to attend business meetings need to relax and recharge their batteries when in transit. Guests who attend conference have to be transported in style and comfort. Employees should be provided with reliable and comfortable travel options, for them to be productive in their work. Our Minibus Hire Reading is best suited for all these purposes. We offer state-of-the-art modern minibus and coaches, capable of ferrying anywhere between eight and 72 passengers in one go. All our vehicles are new and spot high-end features worthy of executive travel. Powerful air-conditioning, plush, well-upholstered seats, the latest music system, high-end safety features, stylish decor, LED reading lights, USB chargers, and a host of other accessories are standard features in our executive coach hire. Our Minibus Hire Reading is the preferred choice for corporates in the region. We offer special rates for corporates who avail our coaches on a regular basis. There are many such corporate and other groups, who always rely on us. They are convinced of the value we offer, and remain impressed with the high quality of service we offer. We offer end-to-end service and strive to delight our customers in everything we do.